Set between Hollywood celebrities on a downtown sidewalk in Palm Springs, California, spa journalist Pamela Price was honored by her hometown mayor for helping put Palm Springs on the map as a spa destination. 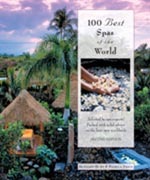 Picture: Pamela Price is co-author of ‘100 Best Spas of the World’. Feted at historic Estrella Inn, a Hollywood celebrity hideaway, Pamela arrived in a 1928 Model A Roadster driven by the president of Palm Springs’ Stroke Centre. The new Estrella Spa set a starry tone as Kur champagne (non-alcoholic) from Brazil’s Kurotel was served. In amongst the crowd was Susie Ellis, Vice President of Industry Development at Spa Finder, Rianna Riego, Spa Director at the Renaissance Esmeralda Resort in Indian Wells, Calif., and Robert Mishkin, CEO of RobeWorks, who sponsored Pamela`s star embedded in the sidewalk. Sheila Cluff, owner of the Oaks at Ojai and the Palms at Palm Springs destination spas, and co anchor with Pamela of The Spa Show (KGAM every Saturday morning) arrived after an overnight flight from her latest fitness cruise. Stars themed the party, from handmade invitations of glisterine soap by Primal Elements, to gifts of desert friendly skincare products by Dr. Hauschka. Energy from Oregon was a gift of Patricia Jean Edge, founder of Crystal Light Healing, who presented Pam with a heart-shaped stone, representing one of the seven chakras. Academy Award-nominated songwriter Carol Connors sang “Which Spa will Wear the Star?” composed especially for the occasion by Aeoliah.